El Paso is in western Texas. The seat of El Paso County, it is located just south of New Mexico on the Río Grande River, opposite Ciudad Juárez, Mexico. It is a port of entry from Mexico and a major road, rail, and air transportation center. With close cultural and economic ties to Ciudad Juárez, El Paso features a blend of United States and Mexican cultures and serves as a gateway to northern Mexico for both tourism and international trade. 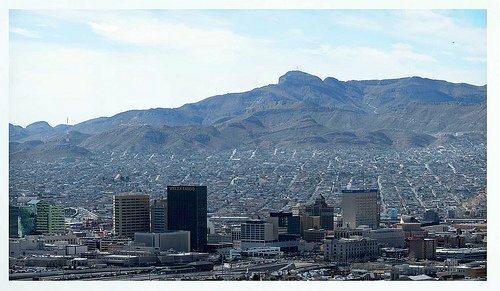 Situated in a pass through the Franklin Mountains with a mean elevation of 3695 ft, El Paso has a sunny, mild, desert environment. 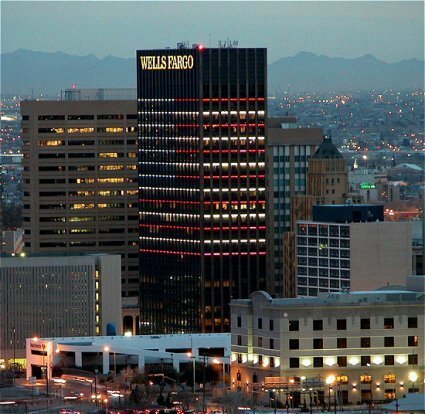 The population of El Paso increases from year to year, largely due to the city's business growth, and its favorable climate. The 300-acre Tigua Indian Reservation, located in the city, is home to about 2000 Native Americans. The metropolitan region, composed of El Paso County, covers a land area of 1013 sq mi and extends to the border of New Mexico; notable population centers besides El Paso are the Fort Bliss military facility and the town of Socorro. El Paso is the commercial and industrial hub of a mining and agricultural region producing cotton, fruit, pecans, vegetables, and livestock. Elephant Butte Dam, on the Río Grande in New Mexico, was completed in 1916 to control flooding of the river and to irrigate the large agricultural region in the river valley. Chief manufacturing activities in El Paso include copper refining and the production of food, clothing, construction materials, electronic and medical equipment, and plastics. Tourism has become an important aspect of the economy, as has trade with Ciudad Juárez. The city's location on the border with Mexico gives it a unique position to take advantage of economic opportunities in international commerce created by the North American Free Trade Agreement (NAFTA), which eliminates most tariffs and barriers on trade among the United States, Mexico, and Canada. A gambling casino is located on the Tigua reservation. Several federal facilities add to the economic base of the city. These include Fort Bliss, site of the U.S. Army Air Defense Artillery Center; William Beaumont General Hospital, a U.S. Army hospital; La Tuna Correctional Institution; and numerous offices relating to immigration and naturalization. Among the major points of interest found in El Paso are Ysleta (//www.texasbeyondhistory.net/paso/excavations.html) and Socorro missions (//www.texasbeyondhistory.net/paso/investigations.html), a zoo, and a planetarium. The Hueco Tanks State Historical Park, located in the parched landscape near the city, features huge sheltered rock depressions that collect and store rainwater. This oasis has long supplied animals and humans with water, and it features pictographs dating from as long as 5000 years ago. El Paso is home to the University of Texas at El Paso, a branch of the University of Texas. In 1916 a fire destroyed the buildings of the school (then known as the Texas State School University of Texas at El Pasoof Mines and Metallurgy), and they were rebuilt in the architectural style of the Himalayan nation of Bhutan. The city is also home to a community college; the Tigua Indian Cultural Center; and the Wilderness Park Museum, which features cultural exhibits about the area's indigenous peoples, including the Apache, Mimbres, Tarahumara, and Pueblo. The city has a symphony orchestra, ballet company, and theaters. Although human habitation of the area began thousands of years ago, the Tanpachoa people are the first known residents in this portion of the Río Grande. 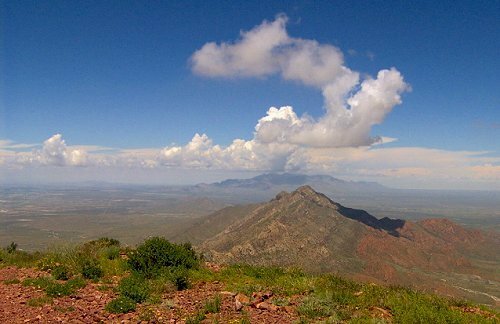 During his journey west from the Gulf Coast to the Pacific Ocean in the 1530s, Spanish explorer Álvar Núñez Cabeza de Vaca probably sighted the pass created by the Río Grande through the Franklin Mountains. Spanish-American explorer Juan de Oñate later visited the site in 1598 and named it El Paso del Río del Norte (The Pass of the River of the North). A mission was founded at the site of modern Ciudad Juárez in 1659. As a result of the Pueblo revolt of 1680 against the Spanish in New Mexico, whites and some Christianized Tigua and Piro peoples escaped to the south, where they established missions and settlements at Socorro and Ysleta. Ysleta, now a part of El Paso, is the oldest continuously occupied settlement in Texas. In 1881 development of the region was spurred by the arrival of railroads, which led to the establishment of smelters, flour mills, and breweries. 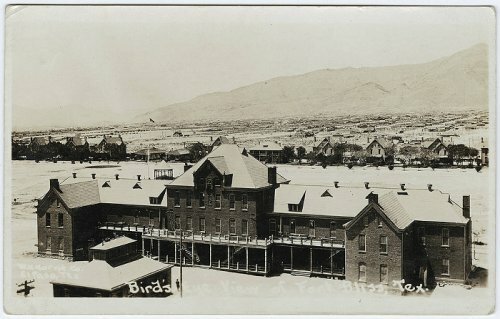 El Paso became a haven for refugees during the Mexican Revolution of 1911, including the revolutionary leader Francisco Villa, also known as Pancho Villa, who recruited many followers from the city. In 1967 a small portion of El Paso was transferred to Mexico, thereby settling a boundary dispute between the United States and Mexico created by changes in the course of the Río Grande. Because of El Paso's close economic association with Mexico, its businesses felt the effects in 1995 when the Mexican peso was devalued and American goods became more expensive to Mexicans.